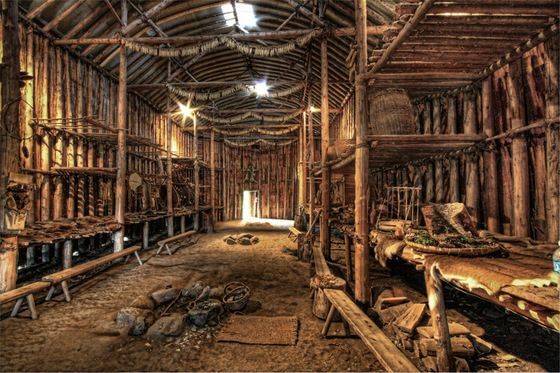 Heroes, Heroines, and History: THE INTERIOR OF THE IROQUOIS LONGHOUSE AND BOOK GIVEAWAY! THE INTERIOR OF THE IROQUOIS LONGHOUSE AND BOOK GIVEAWAY! If you’re like me, you love to “feather your nest” as the old saying goes. Most women and even many men love nesting, and playing around with my home’s décor is one of my favorite pastimes. 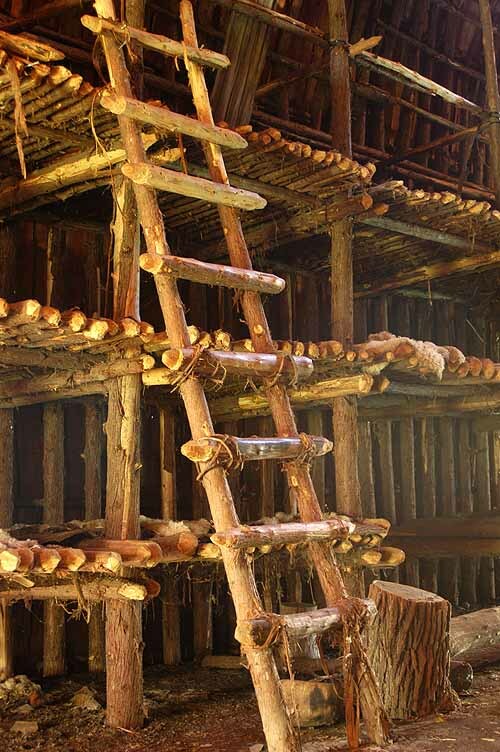 So when I began research on the Seneca for The Return, Book 2 of my Northkill Amish Series, coauthored with Bob Hostetler, I was especially interested in discovering how Iroquois longhouses were built, and not only how the interior spaces were used, but also how they were decorated. After all, native peoples weren’t any different from European settlers in wanting their homes to offer a pleasing appearance in addition to utility and comfort. Last month I covered how a longhouse is built. Today let’s take a look at the interior space. The pole framework of the longhouse divided its interior into a series of compartments from front to back, with a 10-foot-wide aisle running down its center. The compartment inside the entry at each end of the structure served as common storage for food supplies, firewood, and other items too large to be kept in the individual families’ personal living space. The rest of the compartments provided space for the families that lived there. Two families lived in each compartment, on opposite sides of the central aisle. They shared a fire pit, which occupied the center of the aisle, so there was a row of fire pits extending from the front to the back of the longhouse, except in the storage areas. To vent the smoke, a hole was made in the roof above each fire pit, with a sheet of bark that could be slid over it in bad weather. When the smoke hole was closed, smoke collected at the high ceiling above the living space for a while, but I’m sure the atmosphere became pretty thick if the vents had to be kept closed for very long! Vents were also sometimes built into the walls to let air and light in, and these also could be closed as needed. Each family’s living space measured about 6 by 10 feet. Wooden screens and mats or hangings of animal skins separated the families’ personal spaces along each wall and offered a certain amount of privacy. A platform built about a foot above the floor along its exterior wall provided seating, work space, and a bed. Woven rush mats and animal pelts covered the platform and the exterior wall to serve as decoration, padding, and insulation, and pelts and blankets were used as covers. Each family stored personal items like tools and clothing beneath the platform as well as some food and a small store of firewood. A raised platform of the same size was often hung about five feet above the lower one, and a third might be added above that. These were used to store clothing and other items and for extra sleeping space as needed. Braided ears of corn and sacks of grain, nuts, and other foods were hung from the rafters, and additional household goods were hung on the walls and partitions. It sounds like a pretty practical and efficient living space to me for wilderness areas, though it’s probably not very comfortable in cold or hot weather. When you consider the community that developed in each longhouse as the clan expanded, you gain a new perspective on the phrase “It takes a village to raise a child.” However, as one reader commented on last month’s post, think of what it would sound like at night with all those men snoring! Have you encountered other unusual types of human habitations? If so, please share. 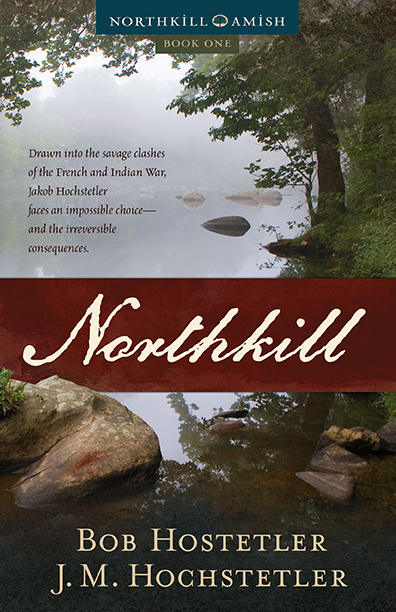 Everyone who leaves a comment on this post by the end of the day Monday, May 16, will be entered in a drawing for a free copy of Northkill! J. M. Hochstetler is a descendant of Jacob Hochstetler’s oldest son John. An author, editor, and publisher, she is the daughter of Mennonite farmers and a lifelong student of history. Northkill, Book 1 of the Northkill Amish Series, won ForeWord Magazine’s 2014 INDYFAB Book of the Year Bronze Award for historical fiction. Book 2, The Return, releases in spring 2017. Her American Patriot Series is the only comprehensive historical fiction series on the American Revolution. One Holy Night, a contemporary retelling of the Christmas story, was the Christian Small Publishers 2009 Book of the Year. You’ll find her at http://www.jmhochstetler.com/. Congratulations and best wishes for your latest project. I will pass your's and Bob's Iroquois Roundhouse piece to Joann, as she has often talked about roundhouse design and uses, especially when visiting Lenape Indian settlements such as Conner Prairie, Glandenhutten, Ohio, Strawtown, Monsee/Minnetrista (Muncie),et al. We'll have descriptions of the Lenape wigewa (or wigwam) in The Return, which I think is what you mean by roundhouse, Lou. The Iroquois longhouse is considerably different in that it's much larger and houses a number of families instead of just one, as the wigewa did. They're both built of the same kinds of materials, however, and have a framework made of stripped saplings. And, of course, the items used by both tribes were essentially the same. In the area we're writing about, you had a lot of Seneca mixed in with the Lenape, so you would have seen both kinds of structures. Joan, thank you for sharing this! This is really interesting.What do you think is the main reason that these tribes lived together in structures such as these? Originally I'm sure it was the lack of the kinds of tools for making more complicated structures like log cabins, MammaG, and the desire for families and clans to maintain close connections as families grew. I also suspect it has to do with the old adage It takes a village to raise a child. In the woodland environment, it was easy and quick to construct this kind of structure and more convenient to simply add onto it instead of erecting a separate building as children married and became parents themselves. Joan, Congratulations on your Northkill series! Thanks for the pictures, I am a visual person so these pictures really help visualize how they lived. I'm glad you enjoyed the article, Mrs. Tina! If you'd like to enter the drawing, I'm happy to substitute one of my other books for any winner who has Northkill. I have Northkill as well, and anxiously waiting for The Return.. This is very fascinating, thanks for sharing. Please enter me in the drawing. Thank you for sharing more about the Iroquois longhouse. Very interesting! Thank you for your very interesting post. I always love coming to HHH for the wonderful posts. I really enjoyed reading your interesting blog post. I've always been fascinated by Native Americans and how they lived. Thank you so much! The Native American cultures have always fascinated me too, Kay, particularly the Northeastern Woodland tribes like the Iroquois, Delaware, and Shawnee. Thanks so much for stopping by, and good luck in the drawing! Very interesting! I kind of feel that the current tiny house movement may have taken some ideas from the 6 by 10 living space each family had. Amazing how they put it all together. Dali, I think you may just be right about that! lol! Thanks for stopping by! Northkill has been on my to-read list for quite awhile now and I'd love to win a copy. Thanks for the opportunity! Thanks for stopping by, Cheryl, and good luck in the drawing! This is another great history lesson from you and HHH. Thank you for sharing and for a chance to win Northkill! Thank you, Connie! I'm glad you dropped by, and good luck in the drawing!